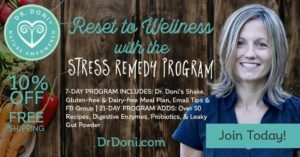 Dr. Doni, author of The Stress Remedy explains how food sensitivities can prevent you from getting a good night’s sleep. She offers advice for breaking the cycle. Can food sensitivities really disrupt your sleep? It can be hard at first to imagine that what you eat could have anything to do with your sleep, but it does—in more ways than one. Let’s have a closer look. As we discussed in Part 4 of this series, sugar and high carbohydrate foods cause your blood sugar levels to fluctuate, which can lead you to wake up during the night. In Part 6, we discussed how insomnia affects your hormones and leads to weight gain. Leptin and ghrelin are hormones that are related to appetite and hunger. When you don’t sleep properly, the levels of these hormones shift causing you to eat more. To make matters worse, insomnia makes your insulin less effective, so you end up gaining weight. Since weight gain has been shown to disrupt sleep, this can easily create a vicious cycle that is hard to break. Part 7 explored how inflammation from any cause, including from leaky gut and food sensitivities, can also affect our sleep. Cytokines (the ‘inflammatory messengers’ that can tell any part of your body to become inflamed) are known to affect your ability to get a good night’s sleep, and become imbalanced when you don’t sleep well. Now, here in Part 8, we are going to talk through in detail how cytokines and inflammatory responses to foods (which start in the gut) actually have the potential to feed into the sleep inflammatory pattern discussed in the previous article in this series, further tilting the scale toward insomnia. Of course, to make matters worse, the less you sleep the more likely you are to crave the foods that cause the inflammation. When everything is working as it should, the food you eat is digested—first by your stomach acid, then by pancreatic enzymes, bile salts, and the enzymes produced by the cells that line your intestines. Food should not be allowed to travel through your intestinal wall unless it is digested down to the smallest molecules. However, the digestion of food is not always optimal, especially when we are stressed and/or taking medications that block stomach acid production. Other times our digestion is compromised due simply to eating something your body is not able to digest fully—such as beans, dairy products, or wheat/gluten. When these partially undigested proteins manage to get through the intestinal wall (this is known as leaky gut), the immune system identifies them as foreign bodies that shouldn’t be there and try to protect you from them by making cytokines which trigger inflammation to protect and antibodies to attack. Two of these antibodies are called IgG and IgA and they respond to viruses and foods that have leaked through the intestinal lining. It is important to note that they have a delayed response which means you may not react immediately to the food that is causing the problems. IgA antibodies tend to respond up to a week after eating the problem food, whereas IgG can react for as long as three weeks after consumption. These antibodies are quite different than the IgE antibody which causes immediate, allergic-type responses, such as hives and anaphylactic shock. As the antibodies respond to the undigested food, they sometimes (but not always) create inflammation that may cause issues with digestion. This means you may react to certain foods and yet never feel it in your stomach. Instead, the inflammation created travels to other areas of your body—one of the most likely is your nervous system because the inflammation can cause the blood brain barrier to become leaky (similar to leaky gut), allowing the cytokines in, and disrupting the nervous system’s careful balance. When the nervous system is affected you might experience anxiety, depression, irritability, brain fog, and/or sleep issues. Gluten and dairy proteins (not lactose, but casein and whey) are two of the most common food sensitivities. A particular problem is that gluten (and wheat in general) is not completely digested by humans, so if you eat it often, and especially if you have a genetic tendency to react to gluten, it is quite likely to be noticed by your immune system. Research shows that gluten causes both leaky gut and inflammation1. It is also worth noting that sleep issues are very common for people who have gluten sensitivity or celiac disease. You could try and guess which foods to avoid—gluten and dairy products are the most likely culprits—but why guess when you can find out for sure. There are many food sensitivity panels out there, but I find the clearest place to start is with an IgG and IgA panel. In some cases IgG and IgA antibodies react to the very same foods and in other cases to different ones so the only way to know is to test them both. IgG and IgA panels are not usually offered by standard labs, or if they are they only test for a few foods. So the best way to get a thorough panel done is to see a naturopathic or functional medicine practitioner—or do it yourself at home. Finding out which foods are triggering your immune system is just a finger prick away—click here to see where you can order the test. There are some aspects of the results that are straightforward. Do you react or not? If you react, then the best way to decrease inflammation in your body is to avoid that food – it’s that simple. Take away what is triggering an immune response, and you’ve eliminated the response and allowed for greater recovery. However, you might find it useful to talk through the results with a specialist because some patterns in the results are not so apparent. Gluten sensitivity for example, can exist even with a low reactivity to gluten. A specialist can help you interpret your results and can also help you with diet changes. If you would like a consultation with me, click here. That’s the thing—your immune system should really not be reacting to the foods you eat nor should it be coming into contact with them. So to truly sort this problem out, we need to heal your intestinal lining in order to prevent other food reactions in the future. Click here to read about healing leaky gut. Gluten—in barley, rye, spelt, and wheat—is known to cause leaky gut whether you have celiac disease or gluten sensitivity, or not2. It does this by increasing a protein called zonulin that opens up spaces between the cells lining the intestines, making it easier for food molecules to leak through into the blood stream. This means gluten starts a cascade toward ever-increasing numbers of food sensitivities (also referred to as cross-reactions). For this reason alone, it’s better to avoid gluten, but gluten is also known to increase inflammation in the nervous system3. Put simply, avoiding gluten allows leaky gut to heal. Click here for support avoiding gluten and wheat. For help with avoiding the foods you react to, you may want to consider following one of my Stress Remedy Programs (available in a 7-day or 21-day version) to support you in making these diet changes. It is designed to be modified to your individual needs. Changing your diet so you avoid those foods you react to has the potential to lower the amount of inflammation in your body as well as to optimize your cortisol and blood sugar levels, all of which leads to a better night’s sleep. Now this is not a “quick fix”—it takes time to make changes to what you eat—but it does have the potential to not only help you sleep better, but also to put your health on a much better path. Remember, the better you sleep, the healthier you’ll be. Have you noticed that certain foods throw off your sleep? Please share your experiences and questions in the comments box. Next time we will be looking at the role neurotransmitters play in sleep. Please subscribe to be sure you receive it direct to your inbox. Fasano Intestinal Permeability and its Regulation by Zonulin: Diagnostic and Therapeutic Implications. Clin Gastroenterol Hepatol. 2012 October; 10(10): 1096–1100. Hadjivassiliou et al. Gluten sensitivity as a neurological illness J. of Neurology, neurosurgery and psychiatry 2002: 72:560-563. What can I do when I’m having an insomnia food reaction? I try to eat only good food to heal my gut and as suggested by my GI also take probiotics, zinc, flaxseed oil, but sometimes allergens are hidden in food (like corn & dairy) without my knowing it. Tried Benadryl, it had no effect. My GP had no suggestions, this seems to be uncharted territory. I’m desperate for something that will combat the allergy reaction and will help me sleep. And when you think you may have eaten a food that causes a reaction, then take pancreatic digestive enzymes to help digest the food. That will minimize the reaction. You can also try the product called Histamine block to help process histamine so that it doesn’t trigger your nervous system – find it at http://DrDoniStore.com.